At the federal level, Canada's Ministry of Unrestrained Climate Misery -- formerly known as the National Energy Board (NEB) -- has already granted full export approval for eleven of the projects and rejected none. It's a big thumbs up to extracting 40 tonnes of additional fossil carbon per British Columbian, every year. Just one of the approved BC LNG projects -- the WCC partnership between ExxonMobil and Imperial Oil -- would create more global warming pollution than 45 Vancouvers. That's twice as much climate pollution as from all the coal mined in BC. It is a giddy "frack and fry" frenzy. To try to grasp the gigantic scale of climate pollution being proposed I spent several days researching all-things-LNG to create the chart below. It shows the lifecycle climate emissions for each of the 13 LNG projects that have been proposed so far. Chart by Barry Saxifrage: click it to view full size. As the chart shows, climate pollution from these 13 LNG projects would range between 6 and 118 million tonnes of CO2 (MtCO2) per year. The average works out to 62 MtCO2/year per project. For comparison, I've put BC's current emissions on the right side of the chart. The City of Vancouver emits 2.5 MtCO2 per year. All the cars in BC emit 9 MtCO2 per year. And all the climate pollution emitted in the entire province adds up to…you guessed it…62 MtCO2 per year. Twice as dirty as the World's Cleanest LNG? "LNG development in British Columbia will have lower lifecycle greenhouse gas emissions than anywhere else. This will differentiate us in the global LNG export market." So far, however, this isn't what is happening. 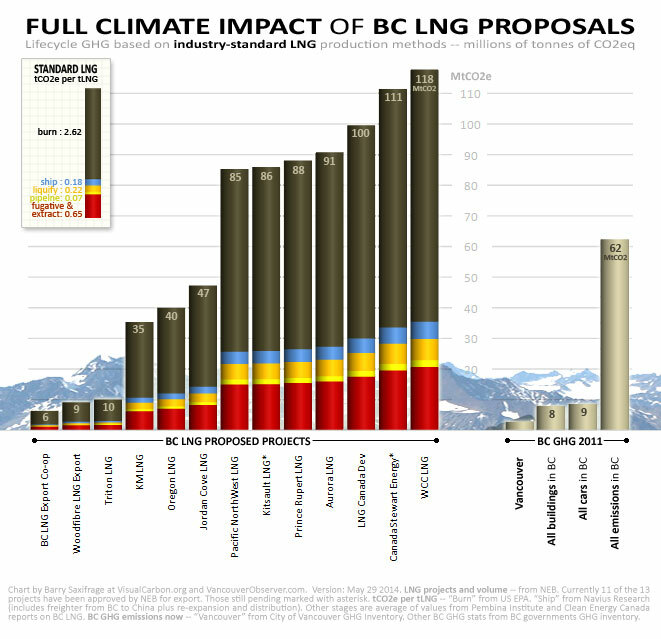 Studies by Clean Energy Canada, the Pembina Institute, Navius Research and others all point to the same conclusion -- under current regulations producing LNG in BC will likely be twice as climate polluting as the world's cleanest LNG projects are today. There are many options for BC LNG projects to match the world's cleanest projects. I recommend Clean Energy Canada's report -- "The Cleanest LNG In The World?" -- as a great starting point for folks interested in learning what could be done. "LNG A BRAND NEW INDUSTRY WITH MASSIVE POTENTIAL"
Sure sounds to me like BC's govenment wants to follow Alberta's example of rapidly increasing the extraction of fossil carbon as fast as possible for decades to come. To quote the rock and roll legend Nigel Tufnel, "It's like, 'how much more black could this be?' and the answer is 'None. None more black.'" THE GEEKY DETAILS -- For readers interested in the nitty gritty, the next page of this article covers the data, sources and calculations used in my chart and the comparison statements above. COMING NEXT -- My next article will focus on what happens to BC's climate goals if multiple LNG projects proceed as planned.